Now that you have read and understood the full Excel Made Easy Website, you can download this diploma showing that you are a master in Excel. But you must have read the FULL website and understood most of it. We can only give you this diploma if you have done this. 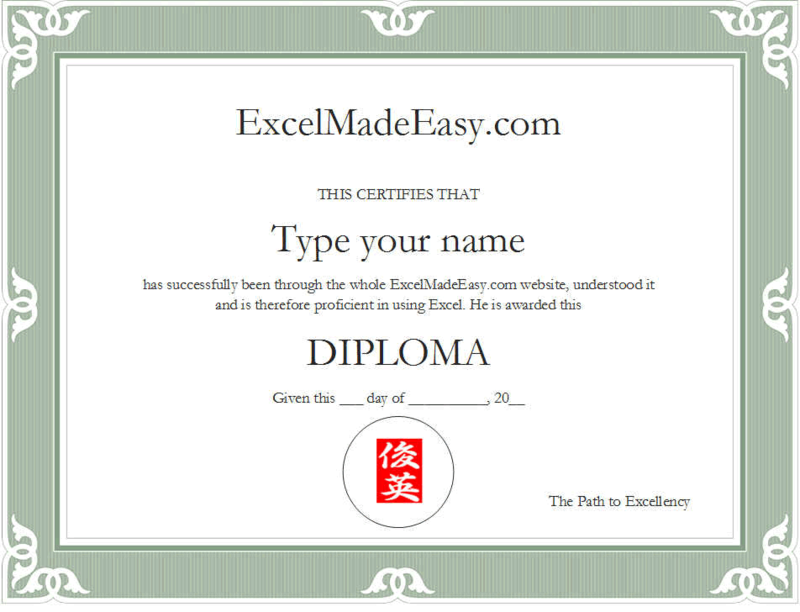 We trust that you will download and use this diploma only if you have read and understood the ExcelMadeEasy.com website. Go for it and welcome to the proud club of the Excel specialists. Do not forget to add your name and enter the correct Date into it, save it and then print it out. Please send us an email to admin (at) Excelmadeeasy.com when you have completed everything and we will send you updates of all the files and tips and tricks. DOWNLOAD the template it Here. You can download the Microsoft Word 97-2003 version (.doc) version template here.